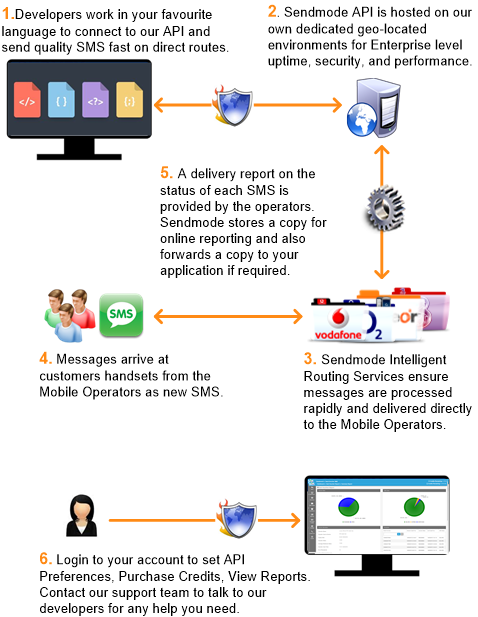 Sendmode’s SMS API Gateway will SMS-enable any site or application. In a few simple lines of code you can connect your application to the mobile world. You can do this using any programming language (.NET, PHP, Java etc) and you will be up and running in minutes. Our sms gateway is fast, secure and reliable ; we provide full documentation with technical support 24/7. We also provide all Delivery Reports which can be sent to a URL of your choice or you can poll the service to retrieve your reports. username * Your Sendmode Account Username. password * Your Sendmode Account Password. numto * The number you wish to send your data to. This number must start with country code and drop the leading zero for example 3538 for Ireland, 447 for UK. data1 * The message you want to send. senderid Display an 11 Character PhoneNumber/BusinessName on Sent SMS. customerid Your own unique system reference number. 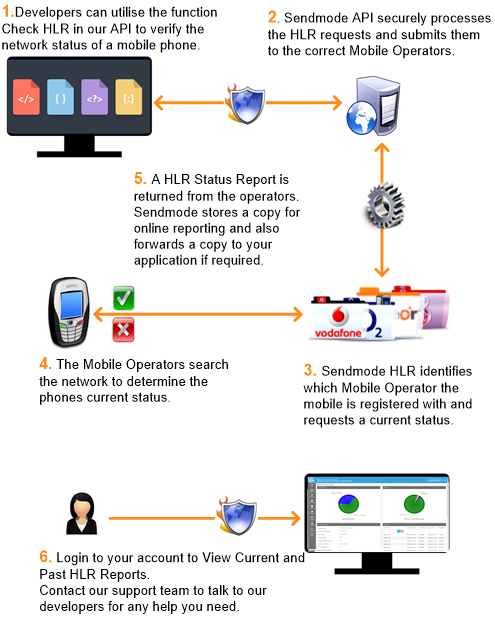 Sendmode’s SMS API Gateway also provides HLR look ups with operators to determine the status of a mobile phone. The most common use is in mobile number database cleaning by identifying no longer valid numbers. Critical contact workflows also use this service to identify if a number is available and route alerts or calls based on the information. mobilenumber * The mobile number you wish to perform the HLR on. The number must be submitted in its fully qualified international format (3538xxxxxxxx, 447xxxxxxxxx). Full document is available on our developer site here. Code samples are available in the following languages. Contact Us today to talk with one of our technical support team.